Sacroiliac leg pain is a type of pseudo-sciatica that usually causes symptoms in the upper rear or outer side of the leg. Leg pain is not a classic manifestation of SI joint symptoms, but is still relatively common in patients with particular types of sacroiliac pathologies and many patients who have been misdiagnosed with structural SI pain who are actually suffering from some other underlying causation. Similarly, leg pain is most commonly viewed as a direct result of lumbar spinal pathology. Since structural abnormalities are almost universal in the lumbar spines of adults, many leg pain symptoms are mistakenly blamed on these incidental irregularities, explaining why treatment for these various lower back issues fails more often than it succeeds. This dialog explains how and why leg pain can result from sacroiliac joint disorders. We will also spend considerable time discussing why many leg pain problems are misdiagnosed and provide patients with some tips to help them achieve more accurate diagnostic verdicts. Leg pain is association with SIJ disorders will rarely be the exclusive symptom presented, although in some cases, it may be the primary expression. In most patient profiles, SI joint-based leg pain will occur in the upper half of the leg, unilaterally, typically affecting the rear or outer side of the leg. 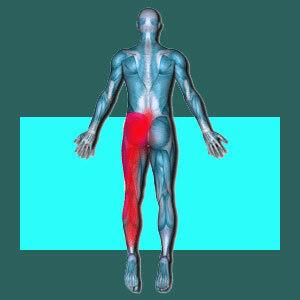 It is far less common for the inner leg to be affected and even less common for the lower leg to be affected by pain. Foot pain is the least common of all symptoms associated with SI joint disorders. Most patients will also demonstrate regional pain in and around the SI joint, including in the buttocks or lower back. Some patients might also demonstrate pain in the pelvis or groin in addition to the affected leg. Minor radiating pain in the very upper aspect of the leg might be considered referred pain from the SI joint, while more substantial symptoms in a larger and lower region of the leg is almost always characteristic of sciatic nerve involvement in the symptomatic expression. As noted above, minor upper leg symptoms that occur near the region where the leg joints into the body might simply be considered referred pain from the SI joint itself, especially if this region is painful and dysfunctional. In this case, virtually any sacroiliac diagnosis might apply. However, true pseudo-sciatica expressions that radiate into the leg will almost always involve the sciatic, which is the body’s largest nerve. Typically if this pain is truly related to a SIJ problem, the nerve is found to be compressed by the sacrospinous ligament, which might become overly tight due to many possible reasons, including injury or compensatory adjustment to muscular imbalance or other ligamentous change within the joint. The first scenario is more common and describes circumstances where the SI is deemed causative for symptoms, despite little evidence that any sciatic nerve compression is occurring. This scenario generally occurs as a revision diagnosis after failed treatment or surgery for coincidental lumbar abnormalities which were also not causative. Often, patients have already undergone spinal surgery which failed miserably, bringing the SIJ into focus as the perspective cause of continuing pain. In many of these scenarios, the piriformis is the true source of symptoms. In others, the mechanism is a regional ischemia syndrome enacted by the subconscious mind. The second scenario describes conditions where the lumbar nerve roots or full formed sciatic nerve are suffering some type of pathology that is unrelated to the sacroiliac, but the joint is blamed nonetheless, since diagnostic evaluation may have shown some form of mobility irregularity. These events are more characteristic of primary diagnosis by non-physician caregivers, such as chiropractors or massage therapists. SI joint treatment will fail, as whatever abnormality is theorized to exist there (if any at all, in truth) is certainly not the source of pain. Meanwhile, the real causation remains undetected, untreated and symptomatic due to misdiagnosis of the origin of pain. We see this scenario often and can assure readers that it is one of the major reasons explaining sacroiliac treatment failure, regardless of which methods are employed. To improve your hopes of accurate diagnosis and effective treatment, seek a second opinion on any theorized cause of pain and be sure that the origin is verified objectively before beginning any form of therapy.